This article is about the present-day Party for Freedom. For the historic party, see Freedom Party (Netherlands). The Party for Freedom (Dutch: Partij voor de Vrijheid, PVV) is a nationalist, right-wing populist political party in the Netherlands. Founded in 2006 as the successor to Geert Wilders' one-man party in the House of Representatives, it won nine seats in the 2006 general election making it the fifth-largest party in parliament. In the 2010 general election it won 24 seats, making it the third-largest party. At that time the PVV agreed to support the minority government led by Prime Minister Mark Rutte without having ministers in the cabinet. However the PVV withdrew its support in April 2012 due to differences over budget cuts at the Catshuis. It came third in the 2014 European Parliament election, winning four out of 26 seats. In the 2017 election, the Party for Freedom won 20 seats, making it the second-largest party in Parliament. The PVV calls for items like administrative detention and a strong assimilationist stance on the integration of immigrants into Dutch society, differing from the established centre-right parties in the Netherlands (like the People's Party for Freedom and Democracy, VVD). The PVV has also proposed banning the Quran and shutting down all mosques in the Netherlands. In addition, the party is consistently Eurosceptic and since early July 2012, according to the platform it presented prior to elections in September, it strongly advocates withdrawal from the EU. Party for Freedom is an association with Geert Wilders as its sole member. The party is ineligible for Dutch government funding and relies on donations. The party's history began with Geert Wilders' departure from the VVD in September 2004. Wilders could not accept the VVD's positive stance towards Turkey's possible accession to the European Union, and left the party disgruntled. Although the VVD expected Wilders to return his parliamentary seat to the party, he refused, and continued to sit in parliament as a one-man party, Groep Wilders (Wilders Group). In June 2005, Wilders was one of the leaders in the campaign against the European Constitution, which was rejected by Dutch voters by 62%. On 22 February 2006, the Party for Freedom was registered with the Electoral Council. Bart Jan Spruyt, director of the conservative Edmund Burke Foundation, joined Wilders in January 2006 in order to formulate a party programme and to train its prospective representatives for the forthcoming national election (then still scheduled for 2007). Spruyt left the party in the summer of 2006 after it proved unable to build broad conservative backing, and people like Joost Eerdmans and Marco Pastors proved unwilling to join. After the 2006 elections, Spruyt said he was not surprised that the Party for Freedom had gained seats but maintained that, if the Party for Freedom had sought cooperation with Eerdmans and Pastors, it would have won more, even enough to bring about a CDA-VVD majority government. Later, Spruyt commented that the PVV had a 'natural tendency' toward fascism. He later qualified the statement, though he didn't withdraw it. Former PVV candidate Lucas Hartong called Spruyt's claims 'a cheap insinuation'. In an HP/De Tijd profile dated December 2006, the party was described as a cult, with an extremely distrustful Wilders only accepting fellow candidates completely loyal to him, and compared the PVV to the Socialist Party led by Jan Marijnissen but without reaching that degree of organisational perfection. On 10 January 2007, the PVV announced it would not field candidates at the forthcoming Provincial elections. This meant it would be unrepresented in the Senate. On 13 January 2007, NRC Handelsblad reported that a PVV intern had solicited for signatures on the website forums Dutch Disease Report and Polinco, the latter a forum described as far-right by various organisations, among them the Dutch Complaints Bureau for Discrimination on the Internet. Any party participating in this election was required to collect at least 30 signatures from supporters in each of the 19 electoral districts; of the 1500 signatures the PVV received, the Dutch Antifascist group identified 34 known far-right supporters. In a response, Wilders said he regretted that far-right sympathisers had provided signatures, denied any personal responsibility for them and reasserted his dislike of far-right parties like National Front of France and Flemish Interest. Noted writer and columnist Leon de Winter later declared the affair to be the result of a campaign of demonisation against Geert Wilders led by NRC Handelsblad and de Volkskrant newspapers, as well as the broadcaster VARA. Former trade union leader and prominent Christian Democrat Doekle Terpstra proposed an initiative against Geert Wilders and the PVV on 30 November 2007, in the newspaper Trouw. Terpstra sees Wilders as promoting intolerance, and discrimination against Muslims. He is supported in his cause by the large Dutch trade unions and refugee organisations. Politicians and the public are divided on Terpstra's initiative. The newspaper De Pers reported the next day that much of Terpstra's claimed support did not materialise. In 2008, the Friends of the Party of Freedom commissioned a producer, who acted under the name of "Scarlet Pimpernel Productions", a pseudonym adopted out of fear of reprisal, to produce Fitna (Arabic: فِتْنَةٌ‎), a short film by Geert Wilders. Approximately 17 minutes in length, it shows selected excerpts from Suras of the Qur'an, interspersed with media clips and newspaper cuttings showing or describing acts of violence or hatred by Muslims. The film attempts to demonstrate that the Qur'an motivates its followers to hate all who violate Islamic teachings. Consequently, the film argues that Islam encourages acts of terrorism, antisemitism, violence against women and homosexuals, and Islamic universalism. A large part of the film deals with the influence of Islam on the Netherlands. The film's title, the Arabic word "fitna", means either "disagreement and division among people" or a "test of faith in times of trial". Wilders described the film as "a call to shake off the creeping tyranny of Islamisation". Polling by Maurice de Hond published in March 2009 indicated that the PVV was the most popular parliamentary party. The polls predicted that the party would take 21 per cent of the national vote, giving it 32 out of 150 seats in the Dutch parliament. If the polling results were to be replicated at a genuine election, Wilders would be a major power broker and could become Prime Minister. However, De Hond's results were not uncontroversial, as they were based on a panel of people who have signed up for the election poll on the Internet and thus were not a random sample. According to Joop van Holsteyn, professor of election research, therefore, De Hond's polls were not representative of the population. Other Dutch polls (Politieke Barometer and TNS NIPO) have shown contrasting results, with the PVV often getting less support, though still remaining very popular. By February 2010, the PVV had once more become the most popular party, according to a poll by Maurice de Hond which said it would win 27–32 parliameary seats in the next election, up two from the previous poll in early January. 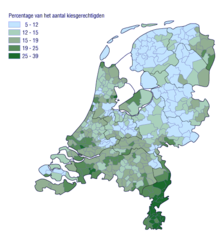 On 3 March 2010, elections for the local councils were held in the municipalities of the Netherlands. The PVV only contested these in The Hague and Almere, because of a shortage of good candidates. MP Raymond de Roon headed the campaign in his home town of Almere. Fellow MP Sietse Fritsma was appointed head of the local election campaign in The Hague. Both men would continue to serve as MPs as well as local councillors after their election. 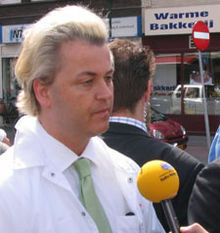 The PVV made big gains, suggesting that the party and Wilders might dominate the political scene in the run-up to the parliamentary elections scheduled on 9 June 2010. The PVV won in Almere and came second to the Labour Party in The Hague. In Almere, the PVV won 21 percent of the vote to Labour's 18 percent, preliminary results showed. In The Hague, the PVV had 8 seats – second to Labour with 10 seats. The local elections were the first test of public opinion since the collapse of the 4th Balkenende cabinet in February 2010. The municipal elections were overshadowed by the fall of the cabinet and the forthcoming parliamentary elections. On 8 March 2010, Wilders announced he would take a seat on The Hague city council, after it became clear that he had won 13,000 preference votes. Earlier he had said he would not do so. One week after these local elections, the PVV called for an inquiry into the elections in The Hague, since a YouTube clip allegedly showed irregularities, including more than one person entering polling booths at the same time and a voter not putting the ballot paper into the box. These calls were rejected. The Hague council said the municipal elections had gone well and that any complaint should anyway have been lodged immediately after the results were announced. In Rotterdam, a full recount was held after a protest by Leefbaar Rotterdam, a local party with a programme broadly similar to that of the PVV. On 18 March 2010, the PVV gave up trying to form a governing coalition in Almere. In a press release, the party said most of the other parties had refused to give ground to PVV demands on what it describes as "essential issues". These include what the party calls ‘city commandos’: street patrols to keep order in the face of inadequate proper law enforcement. Other obstacles were the PVV's demands for reduced taxes for Almere residents and its fight against what the party sees as "the increasing influence of Islam in Dutch society". The PVV complained that it was forced to stay in the opposition through the manoeuvring of the political elite. In the parliamentary elections of 9 June 2010, the PVV went from 9 to 24 seats (of 150), winning over 15% of the votes, making the PVV the third largest party in parliament. By July 2010, the PVV again became the biggest party in the polls after the parliamentary elections, following difficulties in forming a new coalition and the PVV technically being excluded from the coalition talks because the CDA showed reluctance to cooperate with the PVV. According to the polls, the PVV would get 35 seats in a new election, which is a record high number. In August 2010, during the difficult cabinet formation following the elections, the PVV emerged as a prominent player in a proposal for a new minority government in the Netherlands. While the party would not gain a ministerial appointment, the PVV would tolerate a centre-right minority government coalition: a proposed deal that would make the party one of the most influential forces. Led by Ivo Opstelten, a former mayor of Rotterdam who was appointed mediator for the next stage of negotiations, the forming of a government of VVD and Christian Democratic Appeal (CDA) with support of the PVV was negotiated; the resulting coalition agreement "included elements it pushed for, such as a burqa ban," though the ban was never put in place. The VVD and CDA would have to rely on the PVV to get important legislation through. With this deal the Netherlands would follow the "Danish model", since in Denmark the anti-immigration Danish People's Party also stayed out of government but supported a minority center-right Liberal-Conservative government. The very fact of the participation of the PVV in these coalition negotiations has caused fierce discussions in political circles[which?] and was considered[by whom?] very unlikely until recently. After the elections, CDA parliamentary fraction president Maxime Verhagen first had stated that as a matter of principle he refused to negotiate with VVD and PVV about a centre-right government, saying that the PVV represented views that could not be reconciled with Dutch law. These objections on principle disappeared in five weeks and Verhagen turned out to be willing to negotiate over a cabinet whose fate would (also) lie in the hands of Wilders. On 20 March 2012, Hero Brinkman quit the party, citing a lack of democratic structure within the PVV among other things; qualifying this with a statement of continued support for the minority Rutte cabinet. Two days later, three members of the States of North Holland representing the PVV followed his example. In July 2012, Marcial Hernandez and Wim Kortenoeven quit the PVV, both citing what they considered to be Wilders' autocratic leadership of the party. In the parliamentary elections of 12 September 2012, the PVV went from 24 to 15 seats (of 150), winning 10% of the vote. In October 2013, the party expelled Louis Bontes, but he kept his seat in parliament. In March 2014, Roland van Vliet and Joram van Klaveren left the party and also kept their seats in parliament. In the European Parliament election on 22 May 2014, the party kept its four seats in the European Parliament. MEP Hans Jansen died on 5 May 2015 and was replaced by Auke Zijlstra on 1 September 2015. On 16 June 2015, the Party for Freedom and other right-wing nationalist parties in the European Parliament formed the political group Europe of Nations and Freedom. Marcel de Graaff of the PVV and Marine Le Pen of the National Front became the first co-presidents of this group. For the 2017 Dutch general election, the Party for Freedom had an election platform of a single page. Before the election, all major parties said they would not form a government coalition with the PVV. A typical House of Representatives has a large number of parties represented, since it takes as little as 0.67 percent of the vote to get a seat. With such a fragmented vote, the PVV would have needed the support of other parties in order to make Wilders prime minister, even if it won the most seats in the House of Representatives. Wilders hinted that a "revolution" would occur if the PVV won the most seats and was still locked out of power. The party won 20 seats (of 150) according to the preliminary results, which is 5 seats more than in the previous election in 2012 and made it the second-largest party in Parliament. The party performed poorly in the 2019 Dutch provincial elections, losing 26 seats, with the Forum for Democracy taking many of its voters. The Party for Freedom combines conservative, liberal, right and left standpoints in a populistic programme. On certain themes like healthcare, social services and elderly care the PVV can be seen as left and social, though selective. Regarding immigration and culture the party is nationalistic. It believes that the Judeo-Christian and humanist traditions should be taken as the dominant culture in the Netherlands, and that immigrants should adapt accordingly. The party wants a halt to immigration especially from non-Western countries. It is hostile towards the EU, is against future EU enlargement to Muslim-majority countries like Turkey and opposes a dominant presence of Islam in the Netherlands. More specifically, the party has called for a banning the Quran, and shutting down all mosques in the Netherlands. The party is also opposed to dual citizenship (see below). The Parliamentary Documentation Center (Parlementair Documentatie Centrum) of the Leiden University characterises the PVV as "populist, with both conservative, liberal, right-wing and left-wing positions". On André Krouwel's map of the Dutch political spectrum in 2012, the Party for Freedom is conservative on the socio-cultural axis, and centrist on the socio-economic axis. In December 2008, the eighth study "Monitor Racism and Extremism", conducted by the Anne Frank Foundation and the Leiden University, has found that the Party for Freedom can be considered extreme right-wing, although "with ifs and buts". Economically they are viewed as a left-wing party. Peter Rodrigues and Jaap van Donselaar, who have academically guided the study, explain this classification with the Islamophobia, nationalism, and "sharp aversion to the strange", subsumed as racism, which they have observed within the party. In January 2010, the report Polarisatie en radicalisering in Nederland (transl. "Polarisation and radicalisation in the Netherlands") by political researchers Moors, Lenke Balogh, Van Donselaar and De Graaff from the Tilburg University research group IVA stated that the PVV was not an extreme right-wing party, but contained some radical right-wing elements. The study claims that the PVV holds xenophobic ideas, but not antisemitic ideas – the PVV describes its culture as Jewish-Christian humanistic. "The PVV statements on Islamisation and non-Western immigrants appear to be discriminatory and the party organisation is authoritarian rather than democratic", said the researchers, who were looking into polarisation and radicalism across the Netherlands. They described the PVV as the "new radical right", a party with a national democratic ideology but without extreme right-wing roots. In particular, the report stated that the party's pro-Israel stance showed that it was not neo-Nazi. It tends however towards a national democratic ideology. Wilders called the report "scandalous"—in particular the link between defending the national interest and the radical right. An alleged earlier version of the report, leaked to the Dutch daily newspaper de Volkskrant in November 2009, said that Wilders' party is an extreme right-wing grouping and a threat to social cohesion and democracy. The paper claimed at the time the researchers were under pressure to water down the conclusions because of their political sensitivity. The Dutch Minister of the Interior and Kingdom Relations Guusje ter Horst, (2007–2010), Labour (PvdA), who commissioned the research, denied exerting any interference. In response, Wilders accused her of "playing a dirty game". Some commentators and international scholarly publications have argued that the party is far-right; for example, the ex-prime minister Van Agt regards the party as ultra-right-wing, and Bert de Vries (CDA) draws comparisons with the small Centre Party. The political scientist Lucardie, on the other hand, considers it necessary to reserve the 'far-right' qualification for national socialists and fascists. International media outlets, similarly, have followed this classification. On the other hand, it has occasionally been regarded as "centre-right". The party has been regarded by some as anti-Polish, anti-Slavic, anti-Romani and anti-Muslim. Wilders however maintains that he is not anti-Muslim, only anti-Islam, summing up his views by stating "I don't hate Muslims, I hate Islam". In February 2007, PVV parliamentarian Fritsma introduced a motion that would have prohibited any parliamentarian or executive branch politician from having dual citizenship. The PVV claimed that dual nationals have unclear loyalty. The motion would have made it difficult, if not impossible for Labour MPs Ahmed Aboutaleb and Nebahat Albayrak to become members of the fourth Balkenende cabinet. The motion had to be withdrawn, however, after objection from the Speaker of the House of Representatives, Gerdi Verbeet (Labour Party). Maastricht University law professor Twan Tak has commented on the risk in executive branch officials having dual citizenship. however the European Convention on Human Rights as reviewed in 2010 ECtHR jurisprudence has reaffirmed that form of discrimination is a violation of a human right. However, in 2007 the PVV planned to call for a vote of no confidence against junior ministers Aboutaleb and Albayrak when the new cabinet had its first meeting with the House of Representatives, claiming that their respectively Moroccan and Turkish passports put their loyalties into question. In the event, the motion was only supported by the PVV itself. The issue of dual nationality, however, was not over yet. On 2 March 2007, Radio Netherlands Worldwide reported that Labour Party MP Khadija Arib, who had been sworn into parliament the day before, was sitting on a commission appointed by the king of Morocco. The PVV said that this commission work endangers Arib's loyalty to the Netherlands, and that she should choose between being a member of the Dutch parliament or the Moroccan commission. Geert Wilders said that Arib's remark on national television that her loyalty lay neither with the Netherlands nor Morocco was shameful. The liberal VVD party similarly remarked that her "double orientation would hurt Dutch integration." All other parties were appalled by the PVV and VVD's comments. Perhaps in the light of the Moldova ruling, in the first Rutte government in 2010 chaired by the VVD leader, supported by the PVV, Marlies Veldhuijzen van Zanten became the new State Secretary for Health, Welfare and Sport, having both Dutch and Swedish nationality. The party fielded a controversial motion in the 2007 general deliberations on the immigration budget, calling for a stop to immigration from Muslim countries. The House of Representatives at first declined to bring the motion forward for debate. Justice Minister Ernst Hirsch Ballin said it was in violation of the Dutch constitution and international law. Another motion by the PVV, against police officers wearing veils, did gain a parliamentary majority. In 2012, the PVV party launched a website named Reporting Centre on Central and East Europeans to receive complaints about Central and East European immigrants in the Netherlands. 'Do you have problems with people from Central and Eastern Europe? Have you lost your job to a Pole, a Bulgarian, a Romanian or another East European? We want to know,' the website states. It displays newspaper headlines such as 'Wouldn't it be better if you went back home?' and 'East Europeans, increasingly criminal'. The European Commission has condemned the website, and EU Justice Commissioner Viviane Reding declared, "We call on all citizens of the Netherlands not to join in this intolerance. Citizens should instead clearly state on the PVV's website that Europe is a place of freedom." The website caused a lot of controversy within the European Union. The PVV has declared that, since it is against state subsidies, it rejects the idea of itself being financially supported by the government and believes the "taxpayers should not pay for political parties they don't support". In 2012, the Dutch Parliament discussed tightening the financial rules for political parties, forcing them to become more transparent. The PVV indicated that it would use any means available to avoid disclosing the identity of its donors. Withdrawal from the European Union. Return to the guilder (old Dutch currency) and abandonment of the euro. Abolition of the European Parliament and no cooperation in any EU activity. Ask the EU to remove the "Dutch" star in the European flag. Repeal flight tax or carbon dioxide tax. Binding referendum on subjects like the EU and a multicultural society. No more tax money to (political) left organisations. Keeping track of the ethnicity of people who have committed crimes. Binding assimilation contracts for immigrants. Taxes on the Islamic headscarf and prohibition of the Koran. Ban on headscarves in any public function. Support Afrikaners, as it is Dutch heritage. Opposition to Turkey's membership in NATO; support for remaining in NATO. Halt all support and propaganda for Palestine and Palestinians. No more windmills and funding for durability or CO2 reduction; no more "fiscal greening". The name 'Party for Freedom' (Partij voor de Vrijheid) is a reference to the Freedom Party (Partij van de Vrijheid), a Dutch political party founded in 1946, shortly after World War II. In 1948, the Freedom Party went on as the People's Party for Freedom and Democracy (Volkspartij voor Vrijheid en Democratie), which is the party Wilders split from. The party logo consists of the party name and a gull in red, white, and blue, which are the colors of the Dutch flag. The gull symbolises freedom or liberty. The gull had also been used as a symbol by the National Socialist Movement in the Netherlands on propaganda posters and for their youth wing, but Wilders claimed it was not inspired by Nazi usage. In order to register for elections in the Netherlands, a political party needs to be an association (Dutch: vereniging), which can be founded by two or more members. The Vereniging Groep Wilders (Association Group Wilders) was founded by the natural person Geert Wilders and Stichting Groep Wilders (Foundation Group Wilders), of which Wilders is the only board member. The association was later renamed to Partij voor de Vrijheid (Party for Freedom). After the creation of the association, Wilders disabled new member registration, resulting in his remaining the sole member of the party. The party does not organise public party conferences and does not have local departments, a youth wing, or a research institute. 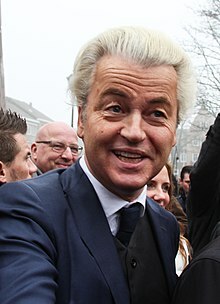 In the Netherlands, a political party needs to have 1,000 members or more to be eligible for government funding, a requirement which the Party for Freedom does not meet with Wilders being the only member. On several instances the PVV applied for and received European Union funding. Financially, the party has been largely relying on donations. The party has not disclosed any of its finances until 2013. According to Hero Brinkman, a former MP for the party, the PVV received most of its finances from certain foreign (American) lobby-groups. According to Reuters, Daniel Pipes' Middle East Forum paid for the trials and security of Geert Wilders and David Horowitz paid Wilders "a good fee" for two speeches given in the US. Since 2013, Dutch political parties are required by law to disclose all donations of 4,500 euro or more. The Party for Freedom disclosed no donations for 2013. For 2014 to 2016, the party disclosed a total of 148,391.07 euro in donations from the California-based David Horowitz Freedom Center, a total of 18,700 euro in donations from a private donor in the Netherlands, and a donation of 6,853.70 euro from the New York-based company FOL Inc. The 2015 donations of just over 108,244 euro from the Freedom Center was "the largest individual contribution to a Dutch political party that year." ^ a b c d e f g h "Partij voor de Vrijheid (PVV)" (in Dutch), Parlement & Politiek. Retrieved 5 March 2017. ^ (in Dutch) "Contact". Party for Freedom. Retrieved 7 May 2018. ^ a b c d e f g Pauwels, Teun (2014). Populism in Western Europe: Comparing Belgium, Germany and The Netherlands. Routledge. pp. 117–118. ISBN 9781317653912. ^ Moreau, Patrick. The Victorious Parties - Unity in Diversity?. The Extreme Right in Europe: Current Trends and Perspectives. Vandenhoeck & Ruprecht. p. 106. ^ Subramanian, Samanth (9 March 2017). "Could the anti-Islam Party for Freedom come out on top in upcoming Netherlands election?". The National. Retrieved 16 April 2017. ^ a b c Thompson, Wayne C. (2014). Western Europe 2014. Rowman & Littlefield. p. 185. ISBN 9781475812305. ^ Rita C-K Chin (2009). After the Nazi racial state: difference and democracy in Germany and Europe. University of Michigan Press. p. 239. ^ "Dutch elections loom as budget talks collapse". Euronews. Archived from the original on 23 April 2012. Retrieved 22 April 2012. ^ "Meeste stemmen D66, CDA grootst". nos.nl. ^ "CDA met vijf zetels grootste partij". RTL Nieuws (in Dutch). 25 May 2014. Retrieved 26 May 2014. ^ a b "Dutch party wants to outlaw mosques, Islamic schools, Koran". Politico. ^ a b "Dutch Far-right Leader Seeks Ban on Quran, Mosques". ^ Magone, José M. (2011). Comparative European Politics: An Introduction. Routledge. p. 17. ^ "PVV: Nederland moet uit EU. (The Netherlands should get out of the EU)". Nos.nl. 23 April 2010. Retrieved 15 January 2014. ^ Bolopion, Philippe (8 March 2017). "Geert Wilders' far-right party suffers donation downturn". Politico.eu. Retrieved 17 March 2017. ^ "Dutch say 'No' to EU constitution". BBC News. 2 June 2005. Retrieved 4 April 2009. ^ "Spruyt sluit zich aan bij Geert Wilders" (in Dutch). Elsevier. 4 January 2006. Retrieved 4 April 2009. ^ de Jong, Addy (17 August 2006). "Historische kans voorbij" (in Dutch). Reformatorisch Dagblad. Archived from the original on 26 May 2008. Retrieved 4 April 2009. ^ Hoekman, Jacob (23 November 2006). "Spruyt: Negeren van Wilders onverstandig" (in Dutch). Reformatorisch Dagblad. Retrieved 4 April 2009. ^ Spruyt, Bart (1 January 2007). "Weimar in aanbouw (deel 1)" (in Dutch). The weblog of Bart J. Spruyt. Retrieved 4 April 2009. ^ Hartong, Lucas (2 January 2007). "Het is me wat!" (in Dutch). Het Vrije Volk. Retrieved 4 April 2009. ^ van der Horst, Alain; Munk, Kirsten; Niemoller, Joost (1 December 2006). "Haagse Sekte" (in Dutch). HP/De Tijd. ^ "Partij Wilders doet niet mee aan Statenverkiezingen". ANP (in Dutch). Volkskrant. 10 January 2007. Retrieved 4 April 2009. ^ "Meldpunt Discriminatie Internet" (PDF) (in Dutch). Magenta Foundation. 1 March 2004. Archived from the original (PDF) on 8 August 2004. Retrieved 4 April 2009. ^ Dohmen, Joep (13 January 2007). "PVV riep steun van extreem-rechts in" (in Dutch). NRC Handelsblad. Retrieved 4 April 2009. ^ "Wilders ontkent oproep tot steun extreem rechts" (in Dutch). Trouw. 13 January 2007. ^ "Extreem-rechtse steun verdriet Wilders" (in Dutch). de Volkskrant. 15 January 2007. Retrieved 5 April 2009. ^ de Winter, Leon (15 January 2007). "De demonisering van Geert Wilders" (in Dutch). Elsevier. Retrieved 4 April 2009. ^ Terpstra, Doekle (30 November 2007). "'Nee' tegen kwade boodschap Wilders" (in Dutch). Trouw. Retrieved 4 April 2009. ^ a b Andringa, Hans (4 December 2007). "Dutch show mixed reactions to anti-Muslim party". Radio Netherlands Worldwide. Archived from the original on 18 October 2008. Retrieved 4 April 2009. ^ Bessems, Kustaw (5 December 2007). "Tekort aan redelijke positivo's" (in Dutch). De Pers. Retrieved 4 April 2009. ^ "Rapper wil 25.000 euro van Wilders". Algemeen Nederlands Persbureau (in Dutch). de Volkskrant. 7 April 2008. Retrieved 8 April 2008. ^ "Hold your breath: 'Fitna' spreading seeds of hatred". Today's Zaman. 29 March 2008. Archived from the original on 2 April 2008. Retrieved 1 April 2008. ^ Park, Michael (21 January 2008). "Iran Warns Netherlands Not to Air Controversial 'Anti-Muslim' Film". Fox News. Retrieved 8 March 2008. ^ "Geert Wilders' Freedom Party rises to 32 seats". Radio Netherlands Worldwide. 29 March 2009. Archived from the original on 2 April 2009. Retrieved 29 March 2009. ^ Waterfield, Bruno (3 March 2009). "Geert Wilders leads Dutch polls". The Daily Telegraph. UK. Retrieved 4 April 2009. ^ "Wilders Now a Celebrity in US and Prime Minister in Poll". NIS News Bulletin. 3 March 2009. Archived from the original on 22 July 2009. Retrieved 4 April 2009. ^ Joop van Holsteyn. "De peiling van Maurice de Hond deugt niet; De waarde van een peiling staat of valt met een representatieve steekproef". NRC Handelsblad. ^ "Partij Voor de Vrijheid". pvv.nl. ^ "Dutch Party for Freedom Recovers Top Rank". Angus-reid.com. Retrieved 18 June 2010. ^ "2e Kamerverkiezingen 2010 – Peilingen 31.01.2010 Maurice de Hond PVV de Grootste". Digitalehofstad.wordpress.com. 31 January 2010. Retrieved 18 June 2010. ^ "PVV picks second MP for local elections". Dutchnews.nl. 21 December 2009. Retrieved 18 June 2010. ^ "Local elections overshadowed by national politics". Nrc.nl. Retrieved 18 June 2010. ^ "Wilders to take council seat in the Hague". Dutchnews.nl. 8 March 2010. Retrieved 18 June 2010. ^ "Anti-Islam MP Geert Wilders has announced he will take up a seat on the local council of the city of The Hague". Rnw.nl. 8 March 2010. Retrieved 18 June 2010. ^ "Calls for local poll recount in The Hague". Rnw.nl. 10 March 2010. Retrieved 18 June 2010. ^ "Rotterdam to investigate proxy voting". Rnw.nl. 10 March 2010. Retrieved 18 June 2010. ^ "Wilders' PVV party 'kept in Almere opposition'". Expatica.com. Retrieved 18 June 2010. ^ "PVV historisch hoog in peiling". www.nu.nl. 18 July 2010. Retrieved 20 July 2010. ^ "Dutch government collapses after far right pulls plug". CNN. 23 April 2012. Retrieved 23 April 2012. The Party for Freedom did not get control of any government ministries, but the coalition agreement included elements it pushed for, such as a burqa ban. No ban has been put in place. ^ Castle, Stephen (5 August 2010). "Outspoken Dutch Politician Makes Inroads". Netherlands: The New York Times. Retrieved 18 December 2011. ^ "Vooral het CDA heeft niets te zoeken in zo'n 'bijzonder' kabinet" (in Dutch). Trouw.nl. Retrieved 18 December 2011. ^ "Hero Brinkman quits the PVV, opposition call for new elections". DutchNews.nl. Retrieved 8 April 2012. ^ "Drie Statenleden PVV Noord-Holland mee met Brinkman". wn.com (in Dutch). World News Network. Retrieved 8 April 2012. ^ Chesal, Robert. "Wilders gives Dutch politics a roller-coaster ride". Radio Netherlands Worldwide. Retrieved 16 July 2012. ^ "Auke Zijlstra (PVV) bevestigt toetreding tot Europees Parlement" (in Dutch), Parlement & Politiek, 2015. Retrieved 19 March 2017. ^ "France's Le Pen announces far-right bloc of anti-EU MEPs", BBC News, 2015. Retrieved 19 March 2017. ^ a b Eric Maurice, "Le Pen becomes group leader in EU parliament", EUobserver, 2015. Retrieved 19 March 2017. ^ "Concept-verkiezingsprogramma PVV 2017-2021" (in Dutch), University of Groningen. Retrieved 19 March 2017. ^ "VVD leader Mark Rutte says 'zero' chance of coalition with Geert Wilders". DutchNews.nl. 16 January 2017. ^ Ashley Kirk; Patrick Scott (17 March 2017). "Dutch election: How the far Right could win but not rule in a country known for its liberal values". The Daily Telegraph. ^ "VVD de grootste, zwaar verlies PvdA" (in Dutch), De Telegraaf, 2017. Retrieved 17 March 2017. ^ "5 things to know about Dutch far right's new figurehead". Politico. 25 March 2019. ^ Partijen in de Eerste en Tweede Kamer - PVV, Parlement.com. ^ "Standpunten". Voor Nederland in Europa (in Dutch). Party for Freedom. 1 April 2009. Archived from the original on 10 April 2009. Retrieved 7 April 2009. ^ "The Netherlands' most popular party wants to ban all mosques". ^ Moors, Hans; Balogh, Lenke; van Donselaar, Jaap; de Graaff, Bob (2009). "Polarisatie en radicalisering in Nederland: Een verkenning van de stand van zaken in 2009" (PDF). IVA. Archived from the original (PDF) on 16 March 2014. Retrieved 6 September 2011. ^ "Wilders' party is 'new radical right'". Dutchnews.nl. 28 January 2010. Retrieved 18 June 2010. ^ "Putting Geert Wilders on the political map". Rnw.nl. Archived from the original on 29 May 2010. Retrieved 18 June 2010. ^ "WC-eend adviseert Guusje ter Horst". Extra.volkskrant.nl. Archived from the original on 2 February 2010. Retrieved 18 June 2010. ^ "Wilders: Minister Ter Horst speelt vuil spelletje". Elsevier.nl. 30 January 2010. Archived from the original on 24 July 2011. Retrieved 18 June 2010. ^ A. Lucardie, ‘Rechtsextremisme, populisme of democratisch patriotisme? Opmerkingen over de politieke plaatsbepaling van de Partij voor de Vrijheid en Trots op Nederland’, in: G. Voerman (ed. ), Jaarboek 2007, Groningen z.j. ^ Ministry of Justice (2008). The governance of Britain: review of voting systems, the experience of new voting systems in the United Kingdom since 1997. The Stationery Office. p. 142. ISBN 0-10-173042-X. David Marquand (2011). The End of the West: The Once and Future Europe. Princeton University Press. p. 51. ISBN 0-691-14159-2. ^ "Dutch liberal leader topping polls ahead of next week's election – The Irish Times – Wed, 2 June 2010". The Irish Times. 2 June 2010. Retrieved 18 June 2010. Peter Beaumont, Almere (16 May 2010). "Geert Wilders, the ultra-right firebrand, campaigns to be Holland's prime minister | World news | The Observer". Guardian. UK. Retrieved 18 June 2010. "Dutch voters boost far-right party of Geert Wilders". CSMonitor.com. 10 June 2010. Retrieved 18 June 2010. "The Dutch elections: Right turn". The Economist. 10 June 2010. Retrieved 18 June 2010. ^ "Netherlands – Political parties". European Election Database. Retrieved 27 June 2010. ^ Dancygier, Rafaela M. (2010). Immigration and Conflict in Europe. Cambridge University Press. p. 287. Monsma, Stephen V.; Soper, J. Christopher (2009). The challenge of pluralism: church and state in five democracies. Rowman & Littlefield. p. 68. Bayat, Asef (November 2007). "When Muslims and Modernity Meet". Contemporary Sociology. 36 (6). ^ Rivers, Dan; Hooper, Simon (2 November 2010). "UK far-right group boasts Tea Party links". CNN. Le Roux, Mariette (10 June 2010). "Far-right election breakthrough shocks Netherlands". Agence France-Presse. ^ Traynor, Ian (17 February 2008). "'I don't hate Muslims. I hate Islam,' says Holland's rising political star". The Guardian. London. Retrieved 15 March 2009. ^ "MPs unimpressed with motion from PVV". Expatica. 16 February 2007. Retrieved 4 April 2009. ^ "'Smoren discussie dubbel paspoort schandalig'" (in Dutch). Elsevier. 15 February 2007. Archived from the original on 24 July 2011. Retrieved 4 April 2009. ^ "Dutch politician doubts Muslim ministers' loyalty". Reuters. 24 February 2007. Retrieved 4 April 2009. ^ "Opposition criticises cabinet in debate". Expatica. 1 March 2007. Archived from the original on 29 September 2007. Retrieved 4 April 2009. ^ el Ayoubi, Mohammed; den Boer, Nicolien (2 March 2007). "Dutch MP to serve as advisor to Moroccan king". Radio Netherlands. Retrieved 5 April 2009. ^ "Kamer akkoord met Marokkaans advieswerk Arib" (in Dutch). Elsevier. 8 March 2007. Archived from the original on 24 July 2011. Retrieved 5 April 2009. ^ "Kamp: Nevenfunctie Arib schaadt integratie". ANP (in Dutch). Reformatorisch Dagblad. 8 March 2007. Archived from the original on 26 May 2008. Retrieved 5 April 2009. ^ Stokmans, Derk (9 March 2007). "Lange dag in de Kamer met veel hatelijkheden" (in Dutch). NRC Handelsblad. Archived from the original on 5 September 2012. Retrieved 5 April 2009. ^ "Nieuwe CDA-staatssecretaris heeft dubbele nationaliteit". Elsevier.nl. Retrieved 15 January 2014. ^ "Minister: Wilders' moslimmotie is onmogelijk" (in Dutch). Elsevier. 22 November 2007. Archived from the original on 24 July 2011. Retrieved 5 April 2009. ^ "'Agente met hoofddoek absoluut onwenselijk'" (in Dutch). NU.nl. 4 December 2007. Retrieved 5 April 2009. ^ "Problems with Poles? Report them to us, says new PVV website". DutchNews.nl. 8 February 2012. ^ "Dutch allow Wilders' anti-Pole website, EU critical". Reuters. 10 February 2012. ^ "Zomergesprek: Geert Wilders (PVV) - NOS Nieuws". Nos.nl. Retrieved 15 January 2014. ^ "PVV zal alles doen om bekendmaking donateurs te vermijden - POLITIEK BINNENLAND - PAROOL". Parool.nl. Retrieved 15 January 2014. ^ "De agenda van hoop en optimisme" (PDF) (in Dutch). Party for Freedom. ^ "Group calls on Dutch rightists to support 'shechita'". ^ "Groep Wilders wordt Partij voor de Vrijheid" (in Dutch). Elsevier. 23 February 2006. Archived from the original on 30 September 2007. Retrieved 5 April 2009. ^ a b Willem Visser, "Kleur en symboliek in de Nederlandse politiek" (in Dutch), Sargasso.nl, 2017. Retrieved 5 March 2017. ^ a b Bas Kromhout, "Wilders gebruikt 'besmet' logo" (in Dutch), Historisch Nieuwsblad, 2008. Retrieved 5 March 2017. ^ "Wilders woedend over vergelijking met NSB" (in Dutch), De Telegraaf, 2008. Retrieved 5 March 2017. ^ "Hoe richt ik een politieke partij op?" (in Dutch), Government of the Netherlands. Retrieved 4 March 2017. ^ "Hoe richt ik een vereniging op?" (in Dutch), Notaris.nl. Retrieved 4 March 2017. ^ a b c Koen Vossen, "Een unieke partij. De organisatie van de PVV" (in Dutch), Montesquieu Instituut, 2012. Retrieved 4 March 2017. ^ Paul Lucardie, "PVV partijgeschiedenis" (in Dutch), University of Groningen, 2013. Retrieved 4 March 2017. ^ a b "Wet financiering politieke partijen" (in Dutch), Government of the Netherlands, 2016. Retrieved 9 March 2017. ^ "PVV wrongly claims €13,000 from Brussels for euro report: tv show", DutchNews.nl, 2012. ^ "'Lobbykantoren VS steunen PVV'" (in Dutch), NU.nl, 2012. ^ Anthony Deutsch & Mark Hosenball, "Exclusive: U.S. groups helped fund Dutch anti-Islam politician Wilders", Reuters, 2012. ^ "Partners Wilders in VS verdienen aan acties tegen moslimextremisme" Archived 12 October 2011 at the Wayback Machine (in Dutch), NRC Handelsblad, 2010. ^ a b Cynthia Kroet, "Geert Wilders’ far-right party suffers donation downturn", Politico Europe, 2017. Retrieved 8 March 2017. ^ "Financieel verslag PVV 2013" (in Dutch), Government of the Netherlands, 2014. Retrieved 8 March 2017. ^ "Financieel verslag PVV 2014" (in Dutch), Government of the Netherlands, 2015. Retrieved 8 March 2017. ^ "Financiële verslagen over 2015 van politieke partijen" (in Dutch), Government of the Netherlands, 2016. Retrieved 8 March 2017. ^ "Overzicht giften en schulden politieke partijen Tweede Kamerverkiezingen" (in Dutch), Government of the Netherlands, 2017. Retrieved 8 March 2017. ^ Mohdin, Aamna. "The Dutch far right's election donors are almost exclusively American". Quartz. Retrieved 11 March 2017. ^ "Party for Freedom", House of Representatives. Retrieved 24 March 2017. ^ "PVV-fractie" (in Dutch), Senate. Retrieved 28 February 2018. ^ "MEPs", European Parliament. Retrieved 19 June 2017. Wikimedia Commons has media related to Partij voor de Vrijheid.